Corn season is in its peak here. Corn that grows in the hills is milky, sweet and soft. Perhaps it is the salubrious climate of the hills that infuses sweetness and tenderness in the corn which is not found in its counterpart that grows in the plains. During monsoons, the villagers in the hills erect makeshift sheds on the roads. They get freshly plucked corns from their fields and roast it in smouldering logs. Roasted corn hisses as it is smeared with lemon and salt. There is a variety of chutneys to choose from. Garlic coriander, lemon masala or bhanga chutney made from bhanga seeds, which is a hill produce. People enjoy the milky corn amidst natural beauty of the hills which is at its best during monsoons. This weekend, after a long time we went to the hills to have corn. We had not one or two but four to five each as we planned to have corn for lunch. It was filling and satiating. Back home, made simple corn bread from the last bit of cornmeal left. 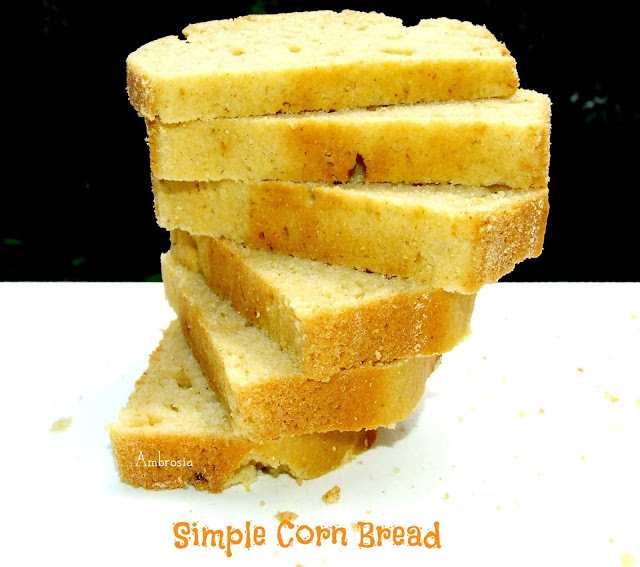 Simple bread, ready in no time and no great prior preparations needed. And yes, as Flyod Mann says, it tastes heaven with butter and honey. Pre heat the oven to 200 degree C. Line and grease a loaf tin (8 x 3 ½ inches). In a wide mouthed bowl, mix sugar, milk and oil. Beat egg lightly and add to the mixture. Whisk together cornmeal, whole wheat flour, all purpose flour, baking powder and salt. 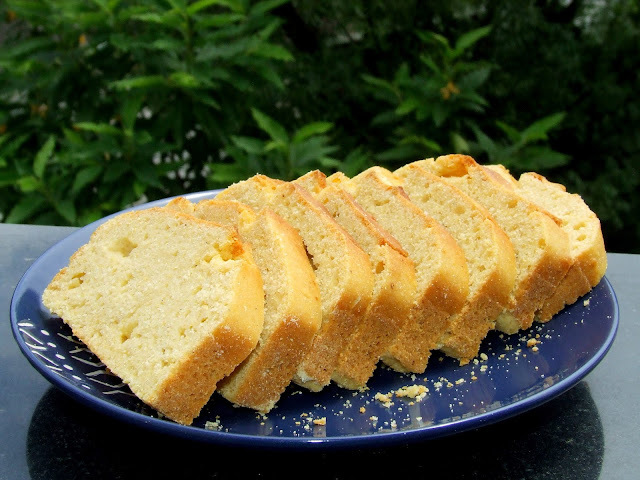 Pour the batter in the loaf tin, bake for 35-40 minutes or when a toothpick inserted in the centre comes out clean. Cool in the loaf tin for 10 minutes. Remove from the tin and cool in the rack. Wrap this bread and keep in a container. Refrigerate. Slice next day. Love the natural yellow colour that you have attained with adding cornmeal. As usual your bread looks very appealing and appetizing. Hello Deepika, I did try an egg less version once. I added 1/2 cup curd and 3 teaspoons of powdered flax seeds in 1 tablespoon of hot water. The bread was quite dense. I shall try to send you the link soon. Hello Gayatri, The bread has a slightly hard crumb. Perhaps it the texture of flours that made the difference. I used "Rajdhani" brand cornmeal. Gayathri, i hope you used the righ sized pan. Size of the pan really matters a lot. Please give me your feedback. Thanks! Hello, made this for breakfast, had with butter and jam. Added a TSP of bp by mistake. Still came out good!